Paediatric continence specialist, June Rogers, shares ideas for helping a child with vision impairment (VI) make the move from nappies to using a potty or toilet. A young child with VI may not realise that other people do wees and poos just like them. So it’s important to talk about it, and help them understand the process and the bits of equipment involved such as potties, toilets and basins. If a mum or dad is going to the toilet, they can take the child in and get them to take part in the routine such as hand washing. One teacher I know lets the children touch the toilet and find out there is water inside it: they can flush it and hear the sound. It’s like any new experience – let them touch the objects involved; learn what they are for and what they are called. When is the right time to toilet train? Any child needs to be physiologically ready to use the toilet. Babies have unstable bladders and may wee up to two times an hour. But as a rough guide, by the age of two most children who don’t have additional disabilities should be able to hold on for one to one and-a-half hours, and two hours by the age of three. How do I know when the child is ready? The modern, super absorbent disposable nappies actually make it harder to tell when a child is wet because they are so successful at keeping urine away from the skin. At around two, when they bladder is likely to be developed enough, you can find out how long they wait between wees by using either washable nappies, or try using something less absorbent to line the nappy such as kitchen paper that won’t disintegrate. Check the nappy every hour over a period of a few days (or as long as you can bear it) to get a picture of how often and when the toddler wees and poos. If they can’t hold on for long enough, then wait a few months and check again. Regardless of their age, once they can hold on for about one-and-a-half hours, and are free of toddler diarrhoea, they are likely to be ready to start using the toilet. Try not to choose a stressful period such as starting a new nursery or when they are going through the “terrible twos”. You don’t suddenly want to plonk a toddler’s bottom on a cold seat because it will be a big shock to them. 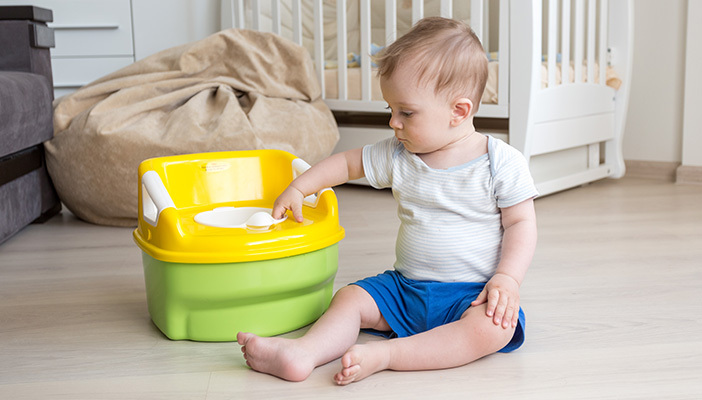 You can introduce a potty from the time the child can sit up, at around 12 months. Try familiarising the baby with the potty by sitting them on it at regular times such as waking up and before bedtime. When your child is ready to start using a potty properly, and you know the usual times they will go, you can put them on the potty at those times. Try pouring jugs of water, to help them make the connection between the sound and what they are doing. Give lots of praise when they succeed in using the potty, and you can try incentives based around what the child enjoys. A child with vision impairment might experience a fear of falling or dislike feeling “left in space” when seated on a toilet. It’s important that any toilet seat feels safe and secure. We have found from specialist teachers who work with children who have VI that they like potty chairs, with a back and arm rest. Sometimes successful toileting might take place in a nursery setting, where the toilets are within cubicles. The child can touch the wall on either side of them to feel secure. There are several helpful pieces of equipment around such as musical potties – rewarding to the novice potty user, and especially good for boys learning to wee standing up as they know when they have hit the target! You can get padded training seats with handles to hold onto, mini-urinals to attach to the toilet bowl, and potties with footplates to help the child get safely in position. It is important to use consistent language. Whatever words you use for wee, poo and toilet, try to use the same words each time. It’s good to agree with professionals and carers on the consistent use of terminology. For example, if a mother asks “Do you want to do a wee wee?” and the nursery staff asks “Do you want to go to the toilet?” this could lead to confusion in the child’s mind. It’s best if parents and nursery staff try to use the same language. Should boys stand or sit? If boys want to stand when weeing, they need to be able to get in the right position. Bigger boys could position themselves against the front of the toilet rim. Their dad can provide physical guidance by standing behind them with hand on hand. They can hear from the sounds they make that they are achieving their goal. This early teaching will help them avoid getting wet legs. It’s important that once you have stopped using nappies, not to use them on the odd occasion such as going out shopping – it is too confusing. The child has to learn to respond to the message from their brain telling them they need a wee and that if they ignore it they will get wet. Children can’t often tell in advance that they need to go, but will gradually learn the different degrees of needing the toilet. This article originally appeared in the 2008 March/April edition of Insight magazine.